Here is a music video in which the things you don't see or hear are almost as important as the things you do. Remnant, built on evolving layers of viola, draws its title from the technique composer and producer Valgeir Sigurðsson follows to assemble the music. 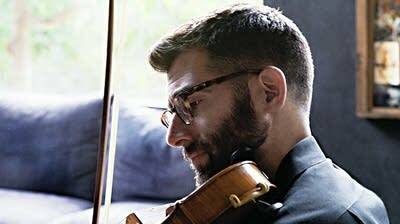 He began with a basic track of digital sounds and recorded violist Jonah Sirota improvising over it several times. Then Sigurðsson  whose studio work includes collaborations with Bjork, Sigur Ros and Nico Muhly  removed the initial guide track. That left only the beautiful, intricate shell of Sirota's viola sounds, which the composer arranged for the final piece. The remaining viola parts orbit one another restlessly. Jarring harmonies, plucked passages and washes of high notes emerge and recede. The video imagery for Remnant also revolves around absence. Empty roads and bare trees turn up repeatedly in scenes that evoke a lonesome, early morning drive. Director Anthony Hawley adds simple, striking color shifts and visual effects to the stark shots of fields and highways. Remnant comes from Strong Sad, Sirota's solo debut. The artist says, on his website, "I made this album not because I am particularly obsessed with the emotion of sadness, but because I believe in the humanity of every feeling. We can't have joy without sadness." Strong Sad (released June 22) arrives a month after the Chiara String Quartet, in which Sirota was a founding member, played its farewell concert following 18 years together. This intimate music marks Sirota's exciting step into the next stage of his career. Brad Turner is a digital editor at Colorado Public Radio.